Submitted by Dan Dooré on Thursday, May 24, 2018 - 16:01. The successor to Flash! , the original art program. 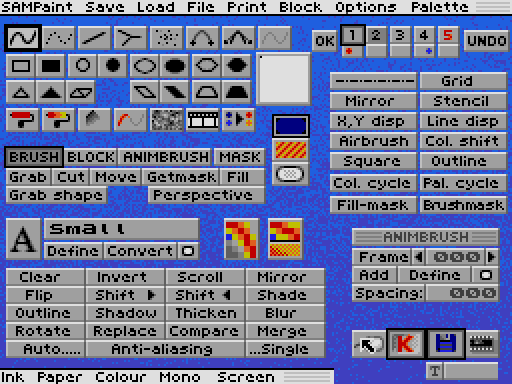 SAM Paint was much more advanced than anything before it and offered many features that the 16bit packages had. Animated brushes, gradient fills, simple filters (outline / shadow etc), multiple screens, undo. Let me state this now. I like SAM Paint, and I never really liked Flash! so basically I’m going to tell you to buy SAM Paint. So what’s so good about SAM Paint? Lot’s of things, most of which I’ll probably miss out. For a start it is designed to be used with a mouse, (though not necessary), it has a lot nicer front end, and lots more features, which I’ll try and list. Smearing / Blending / Bluring. 4 Work Screens, with option to use a work screen as the pen ‘colour’, and using other screens as a reference for functions. Bezier Curves / Curve fitting. Rectangles, Squares, Circles, Ellipses, Polygons, Parallelograms, Triangles. Bending of Blocks / Screens / Gradient Fill. Squeezing of Blocks / Screens into a shape. How can you tell I quoted some of those without really knowing what they do? There is lot’s of other stuff as well, it’s packed with features, and even a completely hopeless artist like me can get some pretty groovy effects out of it. SAM Paint only really uses MODE 4, and MODE 3 to some extent. Though screen conversions are avaliable. Strange as it may seemed, but I reckon we have already set the tone for this review. I have been using Flash! now for 4 years now. I’ve been creating plenty of masterpieces on this trusty utility, and as well as that, I’ve been getting around all of the restrictions which come part and parcel with the dated technology of when it was programmed by Bo Jangeborg . Now everything has changed - definitely for the better! Before I go on, I will be sending a copy of this review to Graham Burtenshaw with about a dozen “thank yous” as he has done the impossible. He has made drawing on the Coupe enjoyable… After dodging through the protection system (which ingeniously uses the manual, making pirating it nigh impossible) and a lovely loading screen, we get to the main balls of SAM Paint. The manual, although absent from pictures of menus, more than makes up for it in descriptions and a step-to-step guide around all of the functions. And there is a LOT of useful functions, I can tell you! After three days of trying out stuff non-stop, I now know my way around SAM Paint. And Flash! has now hit the bottom of the disk pile. I may be a bit premature with my verdict here (being at the start of the review and all) but there is plenty of stuff which SAM Paint can do much better than Flash! First, of course, all Flash! screens can be loaded into SAM Paint. Not only that, but you can load in FOUR different screens at once, each one can be interchanged and merged with each other. The only bug-bear here is that you can only use one palette for all four screens, but you’ll be using the four screens to create one anyway, so this is just to my taste. The Options take up all one screen, which you can come to at any time and use to select stuff before returning to one of your four screens. One advantage which is seen here is that you can see ALL of each screen, not in the case of Flash! which restricts you to two thirds of the screen. You can use keys (same as Flash! ), but even though a Search: “Mouse” is easier to move huge blocks of graphics (like I always do) I still prefer keys for the Options screen. It ain’t the end of the world, y’know! Okay.. let’s roll off the huge list of advantages of SAM Paint (and there is PLENTY!). There is a huge variety of brushes, which can be designed on a special designer. There is even a brush for painting with one screen onto another! Oh, and there is also the feature of a graphic block brush which is much faster than Flash! Freehand drawing is a doodle, with greater detail using the two special zoom modes. You can draw lines like on Flash, but ellipses are much more user friendly. You can ROTATE ellipses while drawing them! You can draw curves and bend them, draw polygons and retain them in memory to duplicate again as well as parallelograms and trapeziums, all of which can also be drawn with graphic block brushes! X,Y co-ordinates can be shown, there is also a rather brilliant airbrush feature which, you’ll find, is greater than Flash’s poor effort… There is cycling, and the Block command is greatly improved in SAM Paint with “see through” blocks as well as normal blocks. There are incredibly useful palette scales which are defined in the package, and can be placed anywhere on the 16 colour palette. There is a Remap function which effectively turns colour pictures to black and white (grey scale). There is an improved FILL option with colour fill patterns which are also defineable, there are much welcome gradient fills, a rather incredible Plasma feature which can create instant “rave” patterns which are invaluable for backgrounds. Blocks can not only be scrolled, Mirrored and flipped like in Flash! but they can be treated for shading effects, shadowing effects, blurring effects, mixing, rotation (yeesss!! ), enlargement and shrinking (double yess!! ), rescaling (I’m gonna die here! ), merging of blocks and screens, comparing, Anti-aliasing (whhhooooppppeee! ), tracing, gradient and block bending, and - text! The text feature is most impressive. On the SAM Paint disk are about 20-odd fonts, each one can be loaded up separate, and can be changed to your heart’s content. Okay, so there is a bit of getting used to with the typing in of lines of text (pressing DELETE twice causes the cursor to become “active” again with the cursors but I now used to this!) but the effects are never ending. You can use the brush to paint the text literally, italicise it, invert it, shadow it, etc. etc. You can also design fonts by “grabbing” portions of the screen, and effectively create a MODE 4 font! You can skew, rescale, distort, clip, flip at axises, and my favourite… perspective! You can take any portion of the screen, and shift it so that you get incredibly realistic and eyecatching effects! you can also get up to 96K of animation on screen on the special SAM Paint built-in animation studio, and then animate it on-screen and save it! You can then use these frames of animation as BRUSHES! Of course, all of SAM’s modes can be used for artwork, and colour printing is possible. Saving can take on many roles - you can save your screen normally, save it compressed, save fonts, save bends and palettes, the lot! I’m literally still in shock over all of the advantages this has over Flash! The amount Fred Publishing are asking for this is a steal for any SAM owner, and you’ll soon be creating masterpieces which you thought could never happen on Flash! 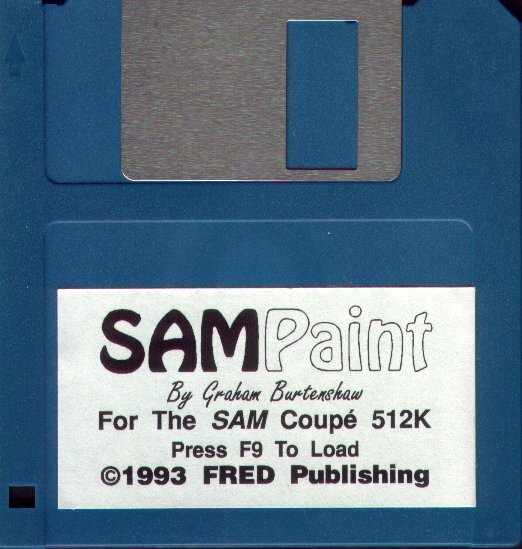 This utility is practically invaluable to any SAM owner, and if West Coast Computers had any sense left in them (which every SAMster is seriously doubting) SAM Paint should be bundled with the Coupe. Get this and be liberated.